The contrast between the silver fox trim and the black cashmere on this cape is truly eye popping. 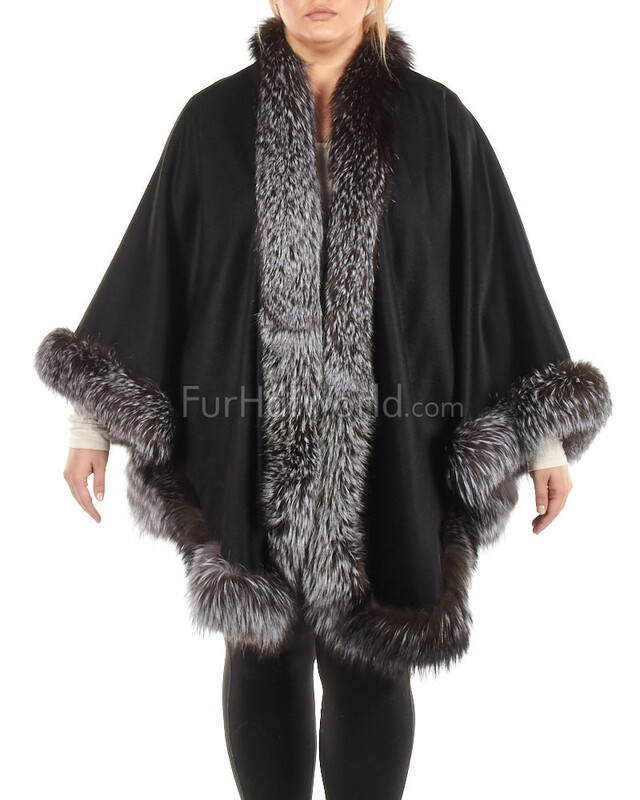 You will have no problem looking like you just stepped off the runway in this beautiful Black Cashmere Cape with Silver Fox Fur Trim. Cashmere is soft and lightweight but it is warmer than wool so you will stay cozy on chilly days. 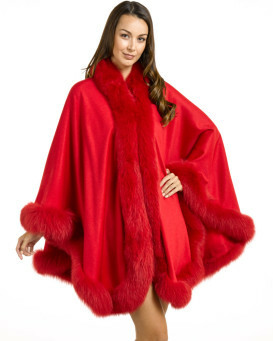 Fox fur is extremely soft which gives this cape an even more luxurious feel. You will love this spectacular Black Cashmere Cape with Silver Fox Fur Trim and want to wear it at every opportunity you get. 4.5 / 5 from 50 customer reviews. "I discovered FHW while we lived in Alberta, Canada for my husbands work eleven years ago. 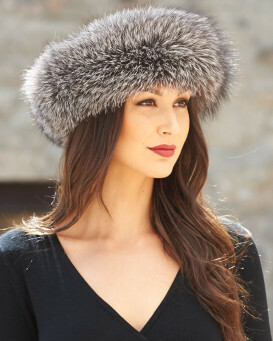 I ordered several wonderful hats, at the time, and always received FANTASTIC service and quality products. 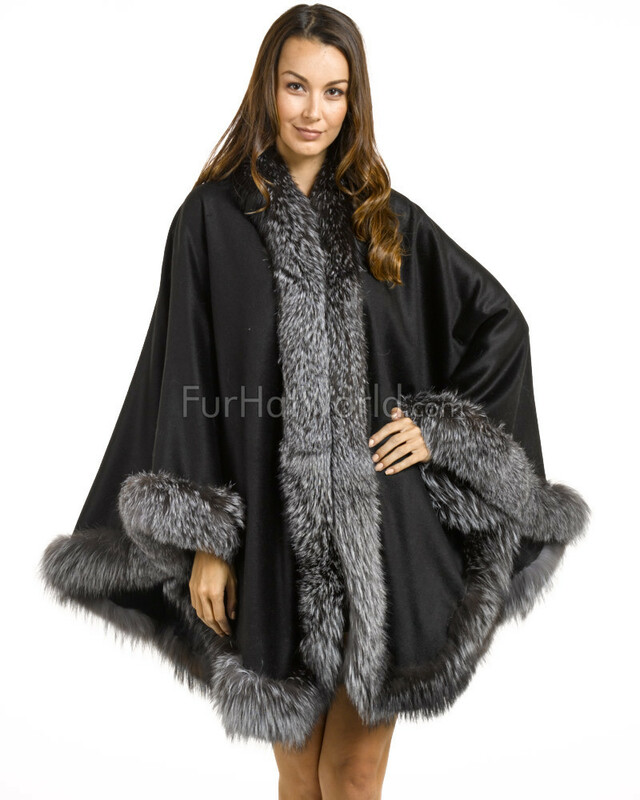 This time, I ordered the CLASSIC CASHMERE CAPE in black with the silver/frost fox trim. It is STUNNING! 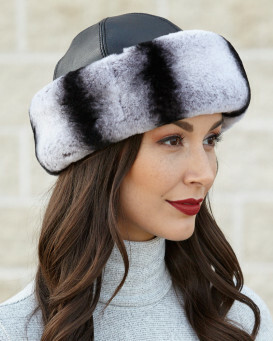 I love the contrast of black cashmere with the silver fox fur. IMO, it gives it contrast and versatility. The cashmere is soft & a good weight; it kept me quite warm wearing two Pringle cashmere sweaters underneath. The fox is LUXURIOUS and THICK! I received my order within a few days of ordering, with tracking info provided. I did have to sign for the delivery, so I appreciated the tracking info. I wore it to President George H.W.Bush's viewing in Houston, Texas. The weather was mild when I arrived at 2:00pm to stand in line & go through security. But, as the evening drew, it got colder & people were shivering. Not me. 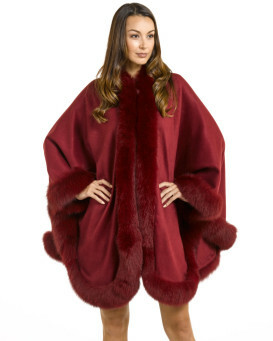 I was VERY comfortable and warm in my cashmere & fox trimmed cape. I felt like Ava Gardner & Grace Kelley wrapped in luxury. People in line were paying me compliments & telling me how LOVELY my cape was & how GORGEOUS I looked! Not bad for a senior citizen. I LOVE FHW & they NEVER disappoint me. Thank you, FHW. You have a loyal customer for LIFE!!" "Beautiful cape exactly as shown. Service was excellent received my cape in 3 days. Thank you"
"I purchased this cape on a whim. I wasn't sure which color to buy since there were so many excellent colors to choose from. 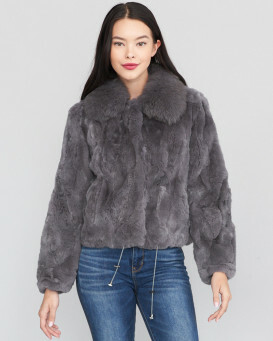 The fur is so thick and luxurious. I love the length. It comes to my knees and will look good with a dress or pants. I can get a lot of wear from this cape. Good choice and an excellent price." "WOW! WOW! WOW! I am so in LOVE with my Cashmere Cape it looked so amazing on. It felt as luxurious as it looked and it was the perfect way to stay warm and look glamorous at an afternoon Wedding Ceremony at the Chateau Yerring in the Yarra Valley with a landscape of vineyards and rolling mountains my cape stole the show. LOVE! LOVE! LOVE!" "I have only tried my cape on when it arrived. Already I know and feel like "a million dollar baby", unfortunately for me, I can show it off yet, this crazy February weather makes it impossible for me to wear my cape. However, it is absolutely marvelous. Just marvelous darling!" "Beautiful quality and has a lovely swing movement to the cape. Very quick delivery, which was a surprise. 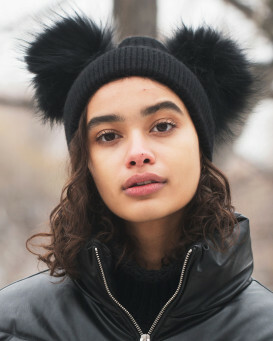 Perfect for a winter wedding. Very happy." "My wife was extremely pleased with the purchase, she wore it to church Sunday (lot of compliments!" 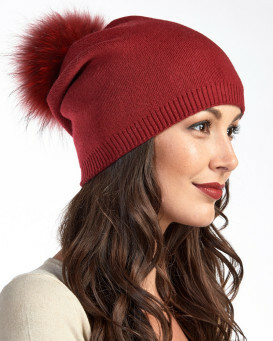 "Living in subtropical climate, this is the perfect weight for a cool evening! 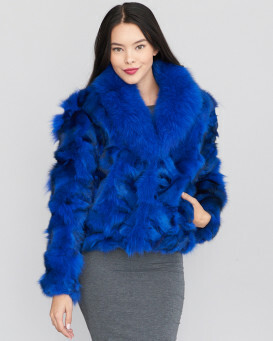 Fur is not too ornate - just perfect. In other words - the cape does not scream “look at me!” The cashmere is par-excellent; it could be much softer. I still love the cape and will wear it as often as climate allows."